Home » Uncategorized » CHRISTMAS IN FEBRUARY? Christmas in February? . . . Why Not! . . . s000000 I know everything is suppose to be all “hearts and flowers” this month but I work at a little slower pace than the rest of the world . 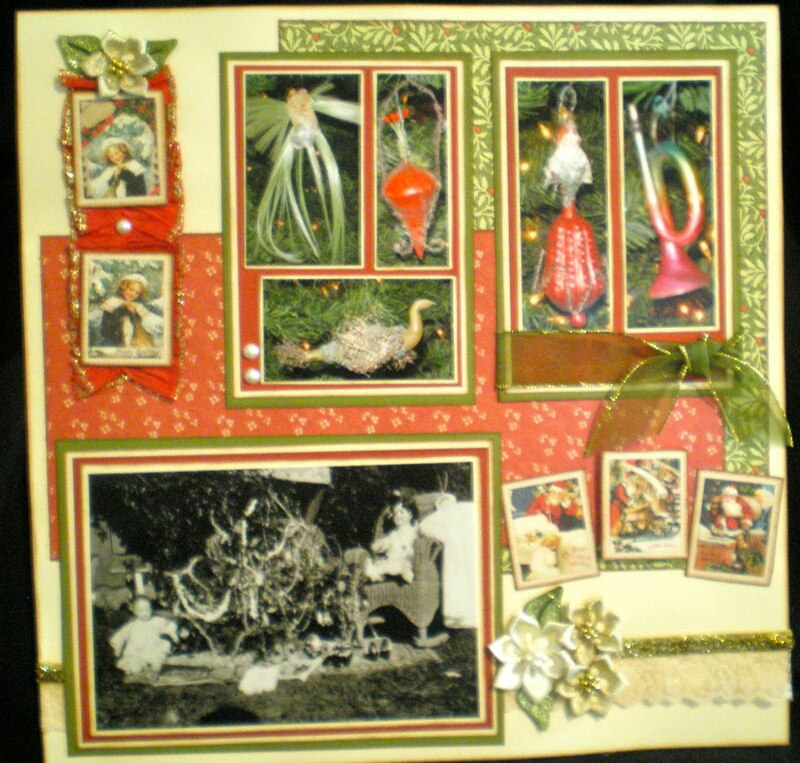 . . soooooooo here is a picture of the layout that I completed in January (which was just yesterday) of a Christmas both in the past and in the present . . . my good friend Christie designed this layout for a class at PSB and when I saw it I knew exactly what pictures would go on it . . . and of course being me I made a few changes from Christie’s original layout . . . like I used cream cardstock for the background instead of the original green and as I seem to be going through a glitz period I added glitter glue all over the place . . . 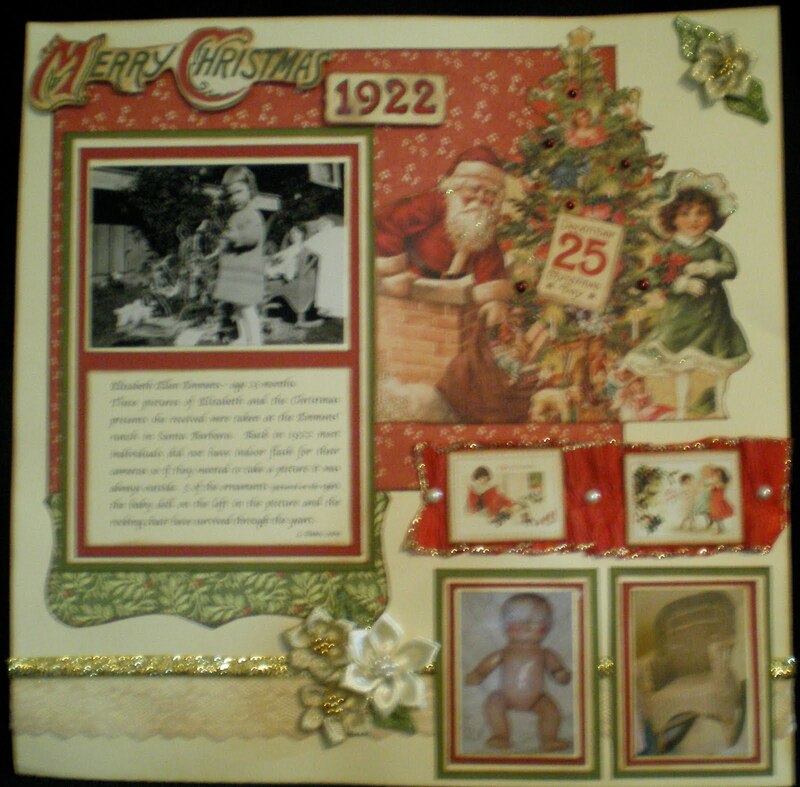 I titled the page Merry Christmas 1922 because the black and white photos are of my mother-in-law (when she was 23 months old) and of the Christmas tree and presents she received that year . . . back in those days cameras were still a pretty rare item for the average person to own and indoor flash lighting did not come with the cameras so all pictures were taken outside which in itself makes these 2 pictures interesting . 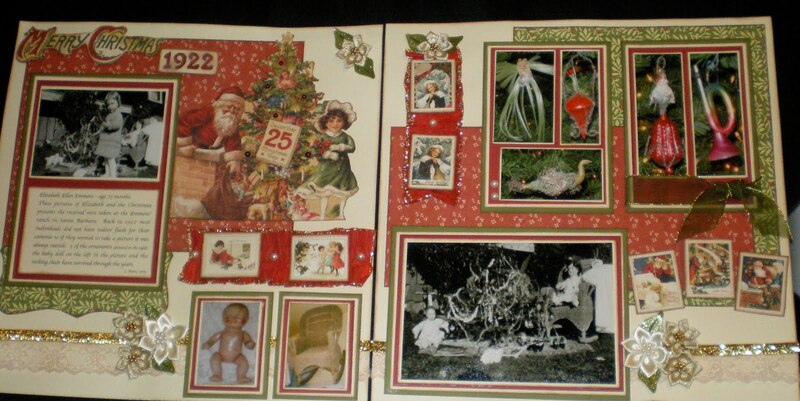 . . the color pictures show the gifts and tree decorations that have survived through the years . . . one of the dolls, the rocking chair and 5 ornaments (the ornaments were on our Christmas tree this year) . . . my husband and brother-in-law threw the doll and ornaments in a dumpster as they didn’t think anyone would want something that old – silly men – I of course then had to do a little dumpster diving to retrieve them . . . below is a close up picture of each of the pages . . .
Well that’s all for now . . . on to completing the class projects from this weekend that were taught by the most talented and funny Irene Tan in Cupertino . . . more about this when I do my next posting . . . till then thanks for stopping by . . . hugs and kisses!!! By YaYaLadybug in Uncategorized on February 1, 2010 . Your layout turned out amazing! I'm so glad that you found a good use for it. And I'm SO happy that you stopped those men from throwing away treasure! !